Components are at the heart of React. Let’s see what we can do to get better error handling and tooling for them! Functional components are my most favourite thing in React. They are simple, purely functional and super easy to reason about. The following shows an example of a functional component with some typed properties. More on the usage of child components in Children. One of the things that convinced me to use React were functional components. The “olde way” of doing components is with class components. And they can keep state per class. State is like props, but private and only controlled by the component. @types/react typings of course have full support for those, and are also equally easy to use. // and state. Since we don't have props, we pass an empty object. // which ones we are allowed to set. // After the component did mount, we set the state each second. // render will know everything! First, setState is aware of its state properties and only allows to set those. 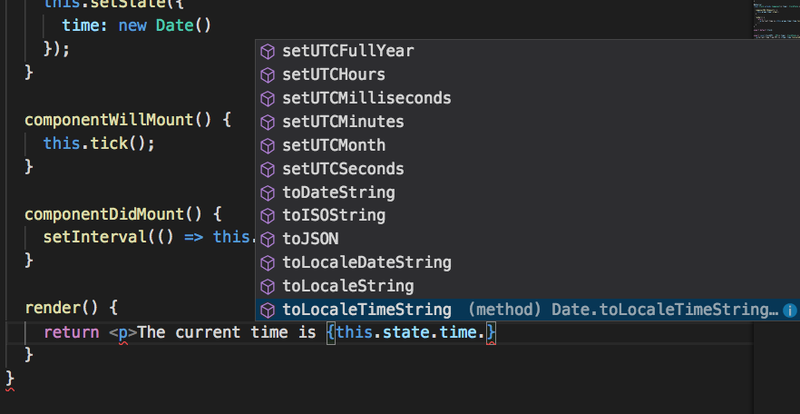 Even if you have more state properties, TypeScript allows you to only set those you want to update. That’s a lot of tooling support, just for a couple of keystrokes more. The type inference of React does the rest. The constructor function is a bit special. You need to pass your props there (even if you don’t have any), and TypeScript requires you to pass the to the super constructor function. However, when writing the typical pattern of constructors and super calls in TypeScript’s strict mode, you will get an error if you don’t provide any typings yourself. This is because you create a new class, with a completly new constructor, and TypeScript does not know which parameters to expect! Therefore, TypeScript will imply them to be any. And implicit any in strict mode is not allowed. Default properties allow you to specifcy default values for properties. In case you don’t want to have every value to be set explicitly. React has the property defaultProps reserved for components. You already can see that you don’t have to write that many typings or boilerplate code in React to get into the nice tooling and type safety features of TypeScript. Components are a huge deal in React, and with just a couple of keystrokes we have everything we need. Let’s see what else we can do in the next section.